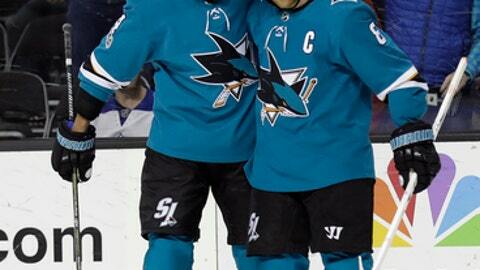 SAN JOSE, Calif. (AP) Rookie defenseman Tim Heed stole the show from Patrick Marleau in his return to San Jose. Marleau finished with two shots on goal but didn’t record a point as Martin Jones made 16 saves for San Jose to improve to 7-0 against the Maple Leafs. Jones has allowed just 10 goals in those starts. Auston Matthews scored in the first period and Nazem Kadri added a goal with 1:10 remaining to cut San Jose’s lead to 3-2. The Maple Leafs have lost four of five and were held to only two shots on goal in a span of more than 31 minutes in the second and third periods. Frederik Andersen made 36 saves but had no chance on Heed’s slapper that went into the top corner after Timo Meier had drawn a cross-checking penalty from Dominic Moore early in the period. The night started with an emotional pregame ceremony for Marleau. The Sharks played a video tribute to Marleau and he received a loud ovation that lasted nearly 90 seconds from the fans, who chanted ”Pat-ty! Pat-ty!” Players from both teams tapped their sticks in appreciation as the spotlight shined on Marleau and he waved to the crowd. The Sharks controlled play for the first two periods but were unable to translate their 25-11 advantage in shots on goal to a lead on the scoreboard. The Maple Leafs struck first midway through the first period when Matthews beat Logan Couture to the rebound of a point shot from Nikita Zaitsev and knocked it into the open net for his ninth goal. San Jose tied it midway through the second when Pavelski deflected Heed’s point shot past Andersen for his third goal. NOTES: Thornton got an assist on San Jose’s first goal, giving him 1,399 points to move past Jari Kurri for sole possession of 20th place on the career list. … Toronto forwards James Van Riemsdyk (lower body) and Matt Martin (upper body) returned to the lineup after missing one game each. Maple Leafs: Visit the Anaheim Ducks on Wednesday night. Sharks: Host the Nashville Predators on Wednesday night.